A graphic from the Office of the President of the Philippines showing the difference in pay between the two types of holidays. In 2001, President Gloria Macapagal Arroyo decided to include holiday manipulation, also known as Holiday Economics as part of the then-new government’s list of principal economic policies, moving the celebration dates for holidays occurring on midweek days to weekend days. This was codified by Republic Act. No. 9492, approved on July 25, 2007, which replaced the list of holidays and special days. This act had been specified by the Administrative Code with a new list of eleven national holidays and three nationwide special days. The act also provided that Eidul Adha shall be celebrated as a regional holiday in the Autonomous Region in Muslim Mindanao. The act specified two of the holidays and one special day with fixed dates, five of the holidays and two special days as occurring on a Monday nearest to or preceding specified dates, and two of the holidays as having movable dates. The act mandated that the President shall issue a proclamation for specifying the specific date movable holidays at least six months prior to the holiday concerned. The act specified that holidays falling on a Wednesday will be observed on the Monday of that week, that holidays falling on a Sunday will be observed on the Monday that follows, and provided that regular holidays and special days may be modified by order or proclamation. Presidential Proclamations issued subsequent to the promulgation of Republic Act No. 9492 established celebration dates for national holidays and special days, and established new holidays and special days, some nationwide and some local to specified localities. The Labor Code of the Philippines specifies two types of holidays: the "regular holiday" and the "special non-working day". There is a difference in the pay that employers are required to pay between the two type of holidays. There is also a difference in what is closed and in how the days are declared. On top of these pay rules, an employee shall be given an additional 30% if the holiday falls on his or her rest day, and an additional 30% if he or she works overtime. Independence Day was formerly celebrated on July 4–-the date of the Philippine independence from the United States in 1946, a date chosen because it was also American Independence Day. On May 12, 1962, President Diosdado Macapagal issued Presidential Proclamation No. 28, which declared Tuesday, June 12 a special public holiday throughout the Philippines, "... in commemoration of our people's declaration of their inherent and inalienable right to freedom and independence." On August 4, 1964, Republic Act No. 4166 renamed July 4 holiday as "Philippine Republic Day", proclaimed June 12 as "Philippine Independence Day", and enjoined all citizens of the Philippines to observe the latter with befitting rites. In 1955, President Ramón Magsaysay issued Presidential Proclamation No. 212, s. 1955, which established the observance of Philippine–American Day every November 15, which was the anniversary of the 1935 inauguration of the Commonwealth of the Philippines. Sometime during the administration of President Ferdinand Marcos, Philippine–American Day was renamed "Philippine–American Friendship Day" and moved to July 4, overshadowing the observance of the date as Republic Day. After the Third Republic and the abolition of the 1935 Constitution under Martial Law, it was impolitic to remind the public of the old republic. This is why, when President Marcos issued Presidential Proclamation No. 2346 s. 1984, reference was made to Philippine–American Friendship Day, which was relegated to a working holiday without mention of Republic Day. During the administration of President Corazon C. Aquino, the practice of celebrating July 4 as both Philippine–American Friendship Day and Republic Day as a non-working holiday was formally abolished. Section 26 of the Administrative Code of 1987 specified a list of regular holidays and nationwide special days that did not include July 4. April 9 Day of Valor Araw ng Kagitingan Fixed Commemorates the Fall of Bataan during the Japanese invasion of the Philippines, and by extension, the courage of Filipino and American soldiers throughout the Second World War. April 18 (2019) Maundy Thursday Huwebes Santo Movable Part of the Triduum of Holy Week and includes the Mass of the Lord's Supper (the Last Supper). April 19 (2019) Good Friday Biyernes Santo Movable Commemorates the suffering, crucifixion and death of Jesus Christ. Processions, passion plays, the recitation of the Pasyon, and various religious services are among the customs practiced on this day. May 1 Labor Day Araw ng mga Manggagawa Fixed Anniversary of the May 1, 1903 rally by the Unión Obrera Democrática Filipina. Held in conjunction with the International Workers' Day. June 12 Independence Day Araw ng Kalayaan Fixed Anniversary of the proclamation of the Philippine Declaration of Independence on June 12, 1898. From 1947 to 1964, Independence Day was celebrated on July 4 (see below). August 12 (2019)  Eidul Adha Eidul Adha / Araw ng kurban Movable Feast at the end of the Hajj when Muslims sacrifice a goat, sheep, cow or a camel to be sent to the poor as a donation. The Hajj is when Muslims go on required pilgrimage to Mecca. August 26 (2019) National Heroes' Day Araw ng mga Bayani Fixed Anniversary of the 1896 Cry of Pugad Lawin by the Katipunan which began the Philippine Revolution and commemorates all the nation's heroes. Held every last Monday of August. Usually, it's the last holiday before the long celebration of the Christmas season which begins on September 1. November 30 Bonifacio Day Araw ng Kapanganakan ni Bonifacio Fixed Birth anniversary of Andrés Bonifacio, de facto national hero. Bonifacio is remembered on his birthday, rather than the date of his death (May 10, 1897), because he was executed by the Filipino revolutionary government and not by colonial powers. Often confused with National Heroes' Day. December 25 Christmas Day Araw ng Pasko Fixed Birth Anniversary of Jesus Christ, main figure of Christianity. December 30 Rizal Day Paggunita sa Kamatayan ni Dr. Jose Rizal Fixed Death anniversary of the Execution of Jose Rizal, considered by mainstream Filipinos as the de facto national hero. February 5 (2019) Chinese New Year Bagong Taon ng mga Tsino Movable Also known as the Spring Festival or Lunar New Year. February 25 EDSA Revolution Anniversary Anibersaryo ng Rebolusyon sa EDSA Fixed Anniversary of the People Power Revolution. April 20 (2019) Black Saturday Sabado de Gloria Movable Part of the Easter Triduum and Holy Week. Commemorates Christ's Descent into Hell as his body lay in the Holy Sepulchre. August 21 Ninoy Aquino Day Araw ng Kabayanihan ni Ninoy Aquino Fixed Anniversary of Assassination of Benigno Aquino, Jr. in 1983. One catalyst for the People Power Revolution in 1986 led to the ouster of Ferdinand Marcos. November 1 All Saints' Day Undás; Todos los Santos; Araw ng mga Santo Fixed Filipinos observe this day by visiting graves, repairing and clean their relatives' tombs and offering prayers, flowers, food, and candles to the dead. Many return to their native provinces to visit ancestral tombs, thus making it an occasion for reunions with extended family. November 2 All Souls Day Araw ng mga Kaluluwa Fixed Marks the end of All Saints Day. December 8 Feast of the Immaculate Conception of the Blessed Virgin Mary Pagdiriwang ng Kalinis-linisang Paglilihi sa Mahal na Birheng Maria Fixed Traditional Catholic feast date of conception of the Blessed Virgin Mary as pure and sinless, honored as mother and Principal Patroness of the Philippines since 1942. It is instituted by virtue of Republic Act No. 10966. It was first observed as a holiday in 2018. December 24 (2019) Christmas Eve Bisperas ng Pasko Special Holiday, Fixed Marks the eve of Christmas. December 31 (2019) New Year's Eve Bisperas ng Bagong Taon (Last Day of the Year) Fixed This holiday is between 2 regular holidays, Rizal Day and New Year's Day. This holiday is a Special non-working day every December 31. January 23 First Philippine Republic Day Araw ng Unang Republika ng Pilipinas Fixed A working holiday which was first observed in 2019. Celebrates the establishment of the First Philippine Republic on January 23, 1899 at the Barasoain Church in Malolos, Bulacan. Last Monday of January National Bible Day Pambansang Araw ng Bibliya Movable A working holiday which was first observed in 2019. Celebrates the value of the Holy Bible as the core of the country's Christian faith professed by millions of its people, held on the Monday following the final Sunday of January which serves as the conclusion of the week-long celebrations of National Bible Week organized by the country's Christian faiths. February 2 Constitution Day Araw ng Saligang Batas Fixed A working holiday which was first observed in 2002. Celebrates the ratification of the current 1987 Constitution. Piyestang Yuanxiao Movable Working holiday among the Filipino Chinese which marks the conclusion of the Chinese New Year festivities 15 days after. April 27 Lapu-Lapu Day Araw ni Lapu-Lapu Fixed A working holiday which will first observed in 2019. Celebrates the victory of Lapu-Lapu and his men over the Spaniards, led by Ferdinand Magellan, during the Battle of Mactan on April 27, 1521. May or June Vesak Day Araw ng Bisyak Movable Celebrated by Filipino Buddhists, to mark three important events in the life of Gautama Buddha: his birth, his Enlightenment, and his physical death and spiritual entry into Parinirvana. In 2001, President Gloria Macapagal-Arroyo signed a proclamation declaring the day in May of the full moon as Vesak Day. June 19 José Rizal's birthday Araw ng Kapanganakan ni José Rizal Movable First declared in 1961 by President Carlos P. García in honor of the birth centenary of José Rizal. Monday, June 20, 2011 was declared a special non-working holiday by President Benigno Aquino III for Rizal's 150th birth anniversary as requested by the National Historical Commission of the Philippines. July 27 Iglesia ni Cristo Day Araw ng Iglesia ni Cristo Fixed In 2009, July 27 was designated by a Republic Act as a yearly special national working holiday to honor the foundation of the Iglesia ni Cristo in 1914. This day was declared as a special non-working day in the year 2014 to commemorate the church's 100th Anniversary. Bagong Taong Islamiko Movable Woking holiday by Filipino Muslims to mark the beginning of the Islamic year. September 23 (2019) Mid-Autumn Festival (Mooncake Festival) Piyestang Zhōngqiū Jié Movable Working holiday by the Filipino Chinese community to celebrate the fall harvest, also a cultural observance by many Filipinos and part of the opening salvo of the long Christmas season which begins in that month, usually the festival period marks the time when the first pre-Christmas sales are held in shopping malls. November 10 (2019) Prophet Muhammad's Birthday Araw ng Kapanganakan ni Propetang Muhammad Movable Known elsewhere as Mawlid, the day marks the birth of the Prophet Muhammad on the 12th day of Rabi' al-awwal, the third month of the Islamic calendar. Philippine cities, municipalities, or barangays, often observe one or more holidays. Being a predominantly Catholic country, these are usually the feasts of the locale's one or more patron saints. Secular observances usually mark a government's founding day or the birth or death of a prominent native. These are often celebrated with parades, processions, entertainment, and feasting, as well as whatever local customs are traditional. Local holidays for the most part are applicable only to the immediate area concerned, and barangay fiestas do not usually warrant a public holiday for the area unless otherwise ordered. Such holidays are usually declared as special non-working day and is proclaimed by the President. January 12 Valencia City Charter Day Araw ng Pribilehiyo ng Lungsod ng Valencia This regular holiday applies to Valencia City only. January 16 Navotas Day Araw ng Navotas This regular holiday applies to Navotas City only. January 17 James Leonard Tagle Gordon Day Celebrated only in Olongapo City and the Subic Bay Freeport Zone, this holiday reflects on the achievements, contributions and heroism of the late politician and city mayor. Third Sunday of January Sinulog This regular holiday applies to Cebu and Tacloban only, honors the Santo Niño. January 22 Vigan Cityhood Day Araw ng Pagkalungsod ng Vigan This regular holiday applies to the city of Vigan. It happens three days before the City's fiesta. February 3 Cabanatuan City Day Araw ng Cabanatuan This regular holiday applies to Cabanatuan City only. February 5 Biñan Liberation Day Araw ng Liberasyon ng Biñan This special working holiday applies to Biñan, Laguna only. February 9 Mandaluyong Liberation and Cityhood Day Araw ng Liberasyon at Pagkalungsod ng Mandaluyong This regular holiday applies to Mandaluyong City only, honoring the 1945 liberation of Mandaluyong and its 1995 elevation to cityhood. February 11 Evelio Javier Day Araw ni Evelio Javier This special non-working holiday applies to the provinces of Antique, Capiz, Aklan, and Iloilo only, in remembrance of the 1986 murder of the popular Governor of Antique whose death was one of the causes of the 1986 People Power Revolution. February 13 Parañaque Day Araw ng Parañaque This regular holiday applies to Parañaque City only. February 24 Cebu City Charter Day Araw ng Pribilehiyo ng Lungsod ng Cebu This regular holiday applies to Cebu City only. February 26 Día de Zamboanga (Zamboanga Day) Araw ng Zamboanga This regular holiday applies only to Zamboanga City only as celebration of the anniversary of the inauguration of Zamboanga as a city, even its Charter was signed on October 12 which is also a holiday in celebration of the Feast of Nuestra Señora del Pilar, the city's patron saint. February 21–27 Musikahan Festival This regular holiday applies to Tagum City only. March 1 Muntinlupa City Charter Day Araw ng Pribilehiyo ng Lungsod ng Muntinlupa This special non-working holiday applies to Muntinlupa City only. March 2 La Union Day Araw ng Pribilehiyo ng Lalawigan ng La Union This special non-working holiday applies to La Union only. March 7 Tagum City Day Araw ng Tagum Commemorating the elevation of then Tagum municipality into the first component city of Davao del Norte. This regular holiday applies to Tagum City only. March 8 Compostella Valley Day Araw ng Lambak ng Compostella This special working holiday applies to Compostela Valley only. March 2 Cavite Day Araw ng Cavite This special working holiday applies only in province of Cavite only. March 16 Davao City Day Araw ng Dabaw Commemorating the signing of the Davao Charter, creating the City of Davao. This special non-working holiday applies to Davao City only. March 18 Panay Liberation Day Araw ng Liberasyon ng Panay This regular holiday applies to all provinces and cities on the islands of Guimaras, Panay and Romblon marking the 1945 liberation of these provinces by joint Filipino and American forces. March 22 Malaybalay City Charter Day Araw ng Pribilehiyo ng Lungsod ng Malaybalay This special working holiday applies to Malaybalay only. March 27 San Juan Day Araw ng San Juan This special non-working holiday applies to San Juan City only. April 21 Calamba City Day Araw ng Calamba Commemorating the signing of the Calamba Charter, creating the City of Calamba. This special non-working holiday applies to Calamba City only. May 3 (Movable) Sampaguita Festival Araw ng Sampaguita This regular holiday applies to San Pedro, Laguna only. May 4 Ilagan Day Aggaw na Ilagan Celebrating the foundation of Ilagan City (as municipality). This special non-working holiday applies to Ilagan City only. May 21 Malabon Day Araw ng Malabon This regular holiday applies to Malabon City only. May 27 San Josee Parish Fiesta Fiesta ni Señor San José Special non-working holiday in honor of Saint Joseph which only applies to Matalom, Leyte. June 1 Biray Festival Pistang Biray/Araw ng Imahen ng Birheng Maria Honors the Blessed Virgin Mary as part of the Flores de Mayo in Belison, Antique. This special non-working holiday applies to Belison, Antique only. June 11 Rizal Province Day Araw ng Rizal This special non-working holiday applies to Rizal province only. June 15 Cagayán de Oro Charter Day Araw ng Pribilehiyo ng Lungsod ng Cagayan de Oro This special non-working holiday applies to Cagayán de Oro City only. June 18 Naga City Charter Anniversary Anibersaryo ng Pribilehiyo ng Lungsod ng Naga This regular holiday applies to Naga City only. June 18 Benguet Foundation Day Araw ng Pagkakatatag ng Benguet This special non-working holiday applies to the province of Benguet only. June 19 Surigao del Sur Day Araw ng Surigao del Sur This special non-working holiday applies to Surigao del Sur only. June 19 Surigao del Norte Day Araw ng Surigao del Norte This special non-working holiday applies to Surigao del Norte only. June 19 Feast of the Forest Pista ng Kagubatan This special working holiday applies to Palawan only celebrating the importance of forests in the province. June 19 Laguna Day Araw ng Laguna This special non-working holiday applies to the province of Laguna only. This also commemorates Dr. José Rizal's birthday. June 19 Calambanga Festival Araw ng Calamba This special non-working holiday applies to Calamba City only. This also commemorates Dr. José Rizal's birthday and a review of the history of Calamba. June 21 Naliyagan Festival' Pistang Naliyagan Special non-working holiday, applies to Agusan del Sur only. June 23 Bacoor Cityhood Day Araw ng Pagkalungsod ng Bacoor This day commemorates the cityhood of Bacoor in the province of Cavite on June 23, 2012. This special non-working holiday applies to Bacoor City only. June 24 Manila Day Araw ng Maynila This special non-working holiday applies to the City of Manila only. It honors the 1571 founding of the city by Miguel López de Legaspi. June 24 Wattah Wattah Festival Pista ng San Juan This special holiday applies to San Juan City only. This day honor Saint John the Baptist, the patron saint of the city. Also known as the Feast of Saint John San Juan Festival. June 26 Batanes Day Araw nu Batanes This special holiday applies to The Province of Batanes only. June 30 Tacloban Day and Tacloban City Charter Day Araw ng Tacloban This special non-working holiday applies to the city of Tacloban only. June 30 Imus Cityhood Day Araw ng Pagkalungsod ng Imus This day commemorates the cityhood of Imus in the province of Cavite on June 30, 2012. This special non-working holiday applies to Imus City only. July 1 Tagbilaran City Charter Day Araw ng Pribilehiyo ng Lungsod ng Tagbilaran A day commemorating the creation of the City of Tagbilaran by virtue of Republic Act No. 4660 on July 1, 1966. This special non-working holiday applies only to Tagbilaran City. July 1 Davao Region Day Araw ng Rehiyon ng Davao Day commemorating the creation of the three Davao provinces from then a "single" Davao province, now Davao Region. This regular public holiday applies to the provinces of Davao del Norte, Davao del Sur and Davao Oriental only. July 1 Maramag Day Araw ng Maramag Day commemorating the recognition of Maramag, Bukidnon as a municipality by virtue of Executive Order 272, which was signed by President Carlos P. Garcia on July 1, 1956. This special non-working holiday applies only to the municipality of Maramag. July 2 Pasig Foundation day Araw ng Pasig This special non-working holiday applies to Pasig City only. Remembers the founding of the city in 1573. July 22 Bohol Day Araw ng Bohol A day commemorating the creation of the Province of Bohol by virtue of Act 2711 on March 10, 1917 and the anniversary of the 1565 Blood Compact. This special non-working holiday applies only to the whole Province of Bohol. July 23 Apolinario Mabini Day Kaarawan ni Apolinario Mabini This special working holiday applies to Tanauan, Batangas only, the city is the hometown of Apolinario Mabini, a leader of the Philippine Revolution. July 23 Batangas City Day Batangas City Foundation Day This special non-working holiday applies to Batangas City in commemoration to its founding. August 2 Butuan City Charter Day Adlaw Hong Butuan This holiday applies to Butuan City only. August 2 Kabankalan City Charter Day Adlaw Kabankalan This holiday applies to Kabankalan City only. August 4 Cabuyao Cityhood Day Araw ng Pagkalungsod ng Cabuyao This day commemorates the Cityhood of Cabuyao, Laguna in 2012. This special non-working holiday applies to City of Cabuyao, Laguna only. August 6 Cebu Provincial Charter Day Araw ng Panlalawigang Pribilehiyo ng Cebu This special nonworking holiday applies to the province of Cebu only. August 9 Ablan Day Kaarawan ni Ablan Commemorates the birthday of Ilocos Norte's late governor and labor leader, Governor Roque B. Ablan, Sr.
August 15 Bulacan Foundation Day Araw ng Bulacan This special non-working holiday applies to the Province of Bulacan only. August 19 Manuel Luis Quezón Day Kaarawan ni Manuel Luis Quezón This special working holiday applies to the provinces of Quezon and Aurora, and to the city of Quezón only in honor of the anniversary of the birth of the Commonwealth President Manuel L. Quezon, born on this day in 1878. August 20 Lucena City Charter Day Araw ng Lungsod ng Lucena This special non-working holiday applies to Lucena City, Quezon only by virtue of Republic Act No. 3271 – An Act Creating the City of Lucena, approved on June 17, 1961. August 25 Iloilo City Charter Day Araw ng Lungsod ng Iloilo This regular holiday applies to Iloilo City only. August 28 Higalaay Festival Adlaw sa Pag-Higalaay sa Dakbayan sa Cagayan de Oro Non-working holiday in Cagayan de Oro City. August 30 Pinaglabanan Day Araw ng Pinaglabanan This special non-working holiday applies to San Juan City only, often in celebration of the 1896 Battle of Pinaglabanan, the first major battle of the Philippine Revolution and the first major defeat for revolutionary forces. August 30 Gat. Marcelo H. Del Pilar Day Kaarawan ni Gat. Marcelo H. Del Pilar This special non-working holiday applies to Province of Bulacan only. August 31 Surigao City Charter Day Araw ng Pribilehiyo ng Lungsod ng Surigao This special non-working holiday applies to Surigao City only. September 1 Baguio City Day Araw ng Lungsod ng Baguio Special non-working holiday only in Baguio City marking its foundation in 1909. September 2 Nueva Ecija Day Araw ng Nueva Ecija This special non-working holiday applies to the province of Nueva Ecija only. September 3 Iriga City Foundation Day Araw ng Establisyento ng Syudad ng iriga This is a Special Non-Working Day Iriga City to honor the city's founding anniversary. September 9 Osmeña Day Araw ni Pangulong Osmeña This is a Special Non-Working Day (Republic Act No. 6953) applicable in Cebu to honor the nation's fourth president on his birthday. Second Friday — Third Sunday of September Peñafrancia Festival Pista ng Peñafrancia Applies only to Naga City and honors the miraculous image of Our Lady of Peñafrancia, the patroness of the Bicol Region. September 9 San José del Monte City Day Araw ng Lungsod ng San José del Monte This regular holiday applies to San José del Monte City only. September 10 Feast of San Nicolás de Tolentino Kapistahan ni San Nicolas de Tolentino This regular holiday applies to Surigao City only. September 11 Marcos Day Araw ni Pangulong Marcos This Special Non-Working Day (Proclamation No. 310) applies to the province of Ilocos Norte only and honors the birthday of the nation's tenth president. September 13 Battle of Pulang Lupa Labanan sa Pulang Lupa This special non-working holiday applies to the province of Marinduque only. Remembers the patriotic victory in the 1903 Battle of Pulang Lupa against American forces. September 17 Siquijor Day Araw ng Siquijor This special non-working holiday applies to Siquijor only. September 18 Tacurong City Charter Day Araw ng Pribilehiyo ng Lungsod ng Tacurong This special working holiday applies to Tacurong City only. September 24 Yulo Day Araw ni José Yulo REPUBLIC ACT NO. 7851 – Special Non-working Holiday in Calamba, Laguna, to commemorate the birth anniversary of the late speaker José Yulo Sr.
October 3 Imus Foundation Day Araw ng Pagkatatag ng Bayan ng Imus This day commemorating the foundation of Imus City (as municipality) on October 3, 1795. This special non-working holiday applies to Imus City only. October 12 Fiesta Pilar Araw ng Kapistahan ni Nuestra Señora del Pilar This regular holiday applies to Zamboanga City only in celebration of its patron saint, Nuestra Señora del Pilar. October 16 Oroquieta City Day Araw ng Lungsod ng Oroquieta This special non-working holiday applies to Oroquieta City only. October 19 Bacolod City Charter Day Araw ng Pribilehiyo ng Lungsod ng Bacolod This special non-working holiday only applies to Bacolod City. October 20 Leyte Landing Day Araw ng Leyte This regular holiday applies to Tacloban only. Commemorates the landing of American and Filipinos forces on Palo Beach during the Battle of Leyte in 1944, signalling the beginning liberation of the country in the Second World War. November 4 President Carlos P. Garcia Day Araw ni Pangulong Garcia Commemorates the birth of Carlos P. Garcia, the eighth President of the Philippines, native of Bohol. This special non-working holiday applies only to the Province of Bohol. November 5 Al Cinco de Noviembre (Negros Day) Araw ng Negros Also called Al Cinco de Noviembre, this special non-working holiday applies to the province of Negros Occidental only. Honors the 1898 Negros Revolution and those who took part. November 16 Quirino Day Araw ni Quirino To commemorate the birth anniversary of late President Elpidio Quirino as declared under Presidential Proclamation No. 1927 dated November 15, 1979 issued by the late President Ferdinand E. Marcos. This special non-working holiday applies to the province of Ilocos Sur only, the very province on which he was born in its capital of Vigan. December 2 Pasay City Day Araw ng Pasay This special non-working holiday applies to Pasay City only, the city was founded on this day in 1863. December 8 Taguig Holiday - As per Proclamation 81 signed December 1, 2010, Taguig Holiday is celebrated henceforth every December 8. December 11 Pampanga Day Araw ng Pampanga Under the virtue of Proclamation no.2226 of late President Ferdinand Marcos. This special non-working holiday applies to the province of Pampanga only, celebrating its 1571 founding as one of the nation's oldest provinces. December 13 General Trias Foundation Day and Valenciana Festival Araw ng Pagkakatatag ng General Trias at Pistang Valenciana This special working holiday applies of General Trias, Cavite only. December 18 López Jaena Day Araw ni Lopez Jaena This regular holiday in Iloilo province and Iloilo City only. Honors Graciano López Jaena and his contributions to the Propaganda Movement of the 1880s. December 20 Feast Day of Santa Lucia Kapistahan ni Santa Lucia This day commemorates Saint Lucy, the patron saint of the town of Santa Lucia, Ilocos Sur. This special non-working holiday applies to Santa Lucia, Ilocos Sur only. December 29 San Pedro Cityhood Day Araw ng Pagkalungsod ng San Pedro This day commemorates the cityhood of San Pedro, Laguna in 2013. This special non-working holiday applies to City of San Pedro, Laguna only. 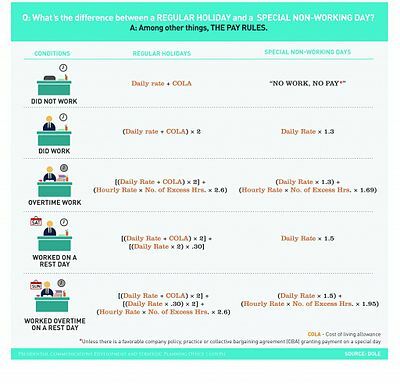 Regular holiday and special non-working day have different pay rules. On a regular holiday, if the employee did not work, the employee is entitled 100% of his daily wage. However, special non-working day usually follows a 'No Work, No Pay' principle. Therefore, the employee is not entitled to any compensation if he did not work that day. If the employee works on the special non-working day, the employee shall be entitled to an additional compensation of 30% of his regular daily wage. ^ "What's the difference between a Regular Holiday and a Special Non-Working Day?". Presidential Communications Development and Strategic Planning Office. Retrieved May 29, 2014. ^ "Administrative Code of the Philippines (Executive Order No. 292, s. 1987)". Official Gazette. Government of the Philippines. ^ "Executive Order No. 292 [BOOK I/Chapter 7-Regular Holidays and Nationwide Special Days]". Official Gazette. Government of the Philippines. ^ "The Economics of Working Holidays}magazine=China Business". ^ "Holiday economics now a law". Philippine Daily Inquirer. July 25, 2007. Archived from the original on October 2, 2010. Retrieved March 13, 2018. ^ "AN ACT RATIONALIZING THE CELEBRATION OF NATIONAL HOLIDAYS AMENDING FOR THE PURPOSE SECTION 26, CHAPTER 7, BOOK 1 OF EXECUTIVE ORDER NO. 292, AS AMENDED, OTHERWISE KNOWN AS THE ADMINISTRATIVE CODE OF 1987". Official Gazette. Government of the Philippines. ^ "Proclamations". Official Gazette. Government of the Philippines. ^ "PROCLAMATION NO. 212". Government of the Philippines. November 4, 1955. ^ "Administrative Code of 1987". Chan Robles Law Library. July 25, 1987. ^ "Executive Order No. 292 [BOOK I/Chapter 7-Regular Holidays and Nationwide Special Days]". Official Gazette. Government of the Philippines. July 25, 1987. ^ "Philippines Public Holidays 2013 & 2014". Public Holidays Philippines. Retrieved November 29, 2013. ^ Louis Bacani (October 5, 2013). "PNoy declares October 5 a holiday for Eidul Adha". PhilStar. Retrieved November 29, 2013. ^ "Bonifacio Day | Philippines | Office Holidays". www.officeholidays.com. Retrieved September 29, 2015. ^ "San Carlos College » Bonifacio Day". sancarloscollege.edu.ph. Retrieved September 29, 2015. ^ "List of Philippines Special Non-Working Day". www.lilkuya.com/philippines-holidays/. Archived from the original on January 4, 2017. ^ "Philippines Proclamation | Official Gazette of the Republic of the Philippines". ^ Subong, Elsa S. (March 18, 2013). "Veterans seek to educate youth on country's history". Philippine Information Agency. Archived from the original on April 16, 2013. Retrieved March 18, 2013. ^ Manager, RONALD ECHALAS DIAZ, Office. "REPUBLIC ACT NO. 6941 – AN ACT DECLARING AUGUST NINE OF EVERY YEAR AS GOVERNOR ROQUE B. ABLAN, SR. DAY, A SPECIAL HOLIDAY IN THE PROVINCE OF ILOCOS NORTE". ^ Republic Act No. 6709, February 10, 1989, Chan Robles Law Li brary. ^ Presidential proclamation No.81 s.2010, Office of the President. ^ "REPUBLIC ACT NO. 6155 – AN ACT DECLARING DECEMBER EIGHTEENTH OF EACH YEAR AN OFFICIAL PUBLIC HOLIDAY IN THE CITY AND PROVINCE OF ILOILO TO COMMEMORATE THE BIRTH ANNIVERSARY OF GRACIANO LOPEZ JAENA". Chan Robles. Retrieved March 18, 2013. ^ "Special Non Working Holiday Pay". Archived from the original on January 16, 2017.